The File Library is used to upload and manage the files used in the checklist templates created in the Knowledge Management application. The File Library is located in the Service Cloud. 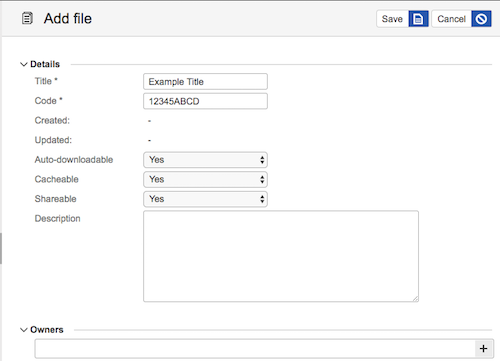 First, you will need to add a file record with which the file upload, revisions, and linked objects can be associated. It is here you will determine how the file behaves (i.e. if it can be downloaded, cached, etc.). Next you will create a file revision for the file record. Revisions enable you to have different versions of files for different scenarios. 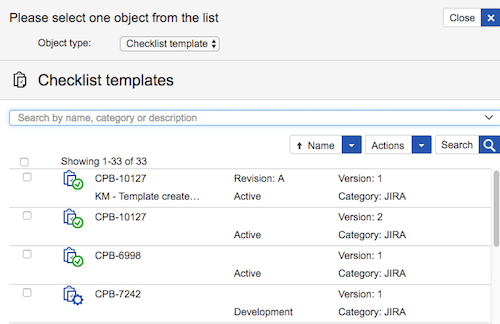 Finally, you can link the file to the checklist template record. It is in this screen where you will enter information about the file. 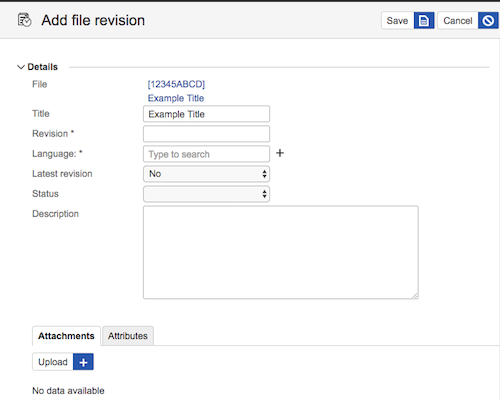 Please note that the file itself will be uploaded in the Add File Revision screen. The information entered here determines the behavior of the file and provides key meta details. Title Required. The title of the file. Code Required. The unique code associated with the file. Created The date and time on which the file was created. Updated The date and time on which the file was updated. Auto-downloadable Yes or no. By selecting YES, the file will automatically be downloaded in the checklist template when synchronizing the mobile application. Cacheable Yes or no. By selecting YES, the file will be cached and available offline if the mobile setting is enabled. Shareable Yes or no. By selecting YES, the file can be shared. Description If applicable, the description associated with the file. Owners If appliable, the owner/s of the file. Relevant permissions for the File, File Ref, and File Revision business objects will be enforced if owners are assigned to the file. It is in this screen where you will upload the file that can then be used in the checklist template. A file revision can only be created AFTER information has been entered and saved in the Add File screen. Please note that you must save the file upload before you can link it to objects. File The name of the file. This name is input when creating the file. Title The file’s title. This will display in the checklist template. Revision Required. The revision number of the file. Language Required. The language of the file. If there are multiple revisions with unique languages, these will then be associated with translated checklist templates. Latest Revision Yes or No. Used to indicate whether or not the revision represents the most current revision. Description If applicable, the description of the revision. Atachments The file attachment associated with the revision. This file attachment will be available in the checklist template. After successfully uploading a file, you can then select the object with which you wish to link it. You can then select Checklist Template from the list of values and select relevant checklist template from the list of available records below. You will then select the ✓ in the link objects screen to complete the object linking. The file will now be associated with the checklist template record.